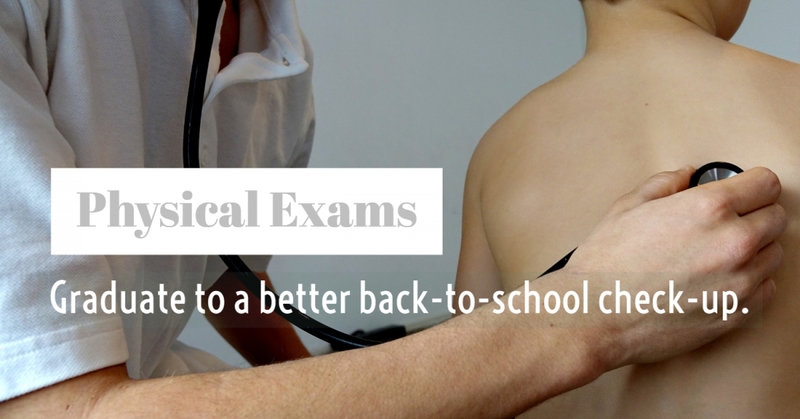 Graduate to a better back-to-school check-up. Summer is coming to a close, which means a new school year is upon us. Soon you’ll be heading to the stores to purchase notebooks, number 2 pencils and the season’s most coveted backpack. More importantly, it’s also time to set up your child’s annual health physical. Routine doctor’s appointments are mandated by many states for school-aged children. Additionally, immunizations are required for school, daycare and Head Start programs. For kids participating in school sports, there may be additional requirements. If you haven’t received this year’s forms, call your child’s school nurse or go to the district’s website to find out what is asked of you. If possible, try to avoid last minute scheduling hassles by making appointments ahead of time. If weekdays are a problem for you, find out if your primary care physician offers weekend visits. And if schedule conflicts keep arising, inquire if you can make an appointment with the school doctor. Once the visit is set, be prepared for the meeting. Start by making a list of medications your child is taking, including prescription and over-the-counter drugs, such as allergy medications, vitamins, herbs and supplements. You can also put them all in a bag to bring with you. Next, write a brief history of your kid’s health, mentioning allergies, chronic illnesses, past surgeries, broken bones and other important episodes. Once everything is compiled, give it to the doctor and the front office staff. The information provides the physician with a better picture of your little scholar’s overall health, impacting potential treatment plans. Additionally, it ensures records are correct and up-to-date. One of the great things about physicals is that they tend to be longer than sick visits, which are often rushed. Make a note ahead of time of any questions or concerns that you or your child may have. This is your chance for a face-to-face discussion. If there’s something you don’t understand, like a medical term, be sure to speak up. And don’t forget to have any school, athletic and daycare forms signed during the appointment. Parents are also encouraged to take notes while their child is being examined. Writing down comments helps you to remember what the doctor said. You can ask your M.D. to repeat instructions if you didn’t get them the first time around. An effective way to ensure you retain the information is to repeat it back to him or her. If you go home and realize you have more questions, contact your doctor immediately for clarification. Seeing healthcare providers on a yearly basis ensures the well-being of your child. Remember: You are your child’s biggest advocate.